What’s an even bigger deal for Apple fans than getting the iPhone 6 on launch day? 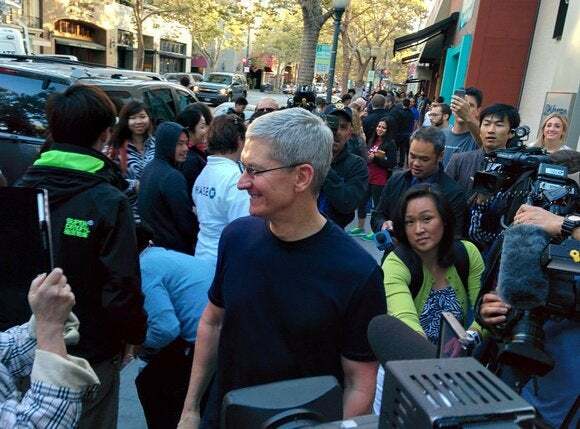 Taking a selfie with Apple CEO Tim Cook. The chief executive walked the line of several hundred people outside the company’s Palo Alto, California, store shortly before the new phone went on sale at 8 a.m. Friday, stopping to shake hands, thank customers and pose for many, many selfies. Cook didn’t have to travel far to get to the store. He lives just a few blocks away in the leafy Silicon Valley town. Steve Jobs lived nearby too and used to turn up at the store to check the atmosphere on launch day, but perhaps never shook as many hands and posed for as many pictures as Cook did. “Good to see you, nice to meet you,” he said as he walked the line. “Can I take a picture?” one asked. “As long as it’s with an iPhone,” Cook shot back. Cook didn’t formally take questions from reporters but a few managed to chat along the way. Cook hails from Alabama, a state where college football is taken very seriously and nothing is more important than the rivalry between Auburn University and the University of Alabama. “Roll Tide,” shouted someone, the football battle cry of the University of Alabama. “War Eagle,” Cook shouted back, the cry of Auburn University. As 8 a.m. neared, he appeared at the doors to the Apple store and took part in the now traditional 10-second countdown, personally swinging the doors open and welcoming the first customers. Some rushed to get their new phones but many paused to take even more pictures with Cook. Apple has said it’s taken 4 million pre-orders for the new iPhones, setting a company record for preorders on new phones.